I feel like I have been absent from the blogging world for so long! I had such great intentions of blogging about Christmas crafts and goodies, and now here it is mid-January. I do have a perfectly legit excuse, though: hubby and I are expecting our first baby in June! Of course we are super excited, and I have been wanting to make all kinds of stuff, but I am just now feeling up to it. I've pretty much been laying around sick and tired for months, somehow powering through the school day and then coming home to do a whole lot of nothing. My sweet husband has been amazing, taking care of everything around the house so I could rest. Over the last couple of weeks, though, the morning sickness has finally gone away and I'm getting my energy back, so it's on to baby projects! 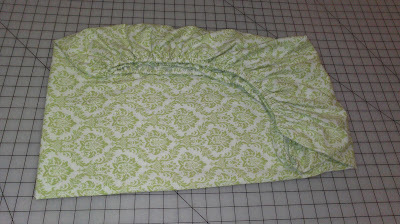 Today, I made some sheets for the baby crib. 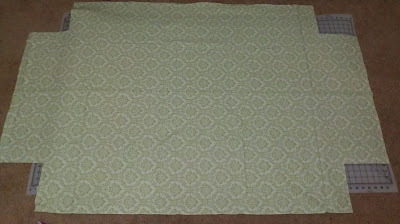 It was a really fast project, taking a little less than an hour for one sheet, from cutting out the fabric to clipping the final thread. It is also cost effective, with the total price for each sheet being about $9. 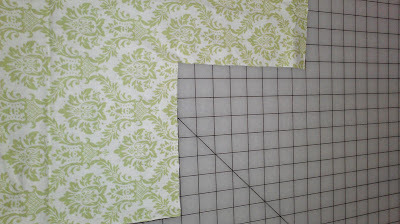 Plus, I can make them in cute colors and patterns that match the baby quilt I am in the process of making. Altogether, a win-win. 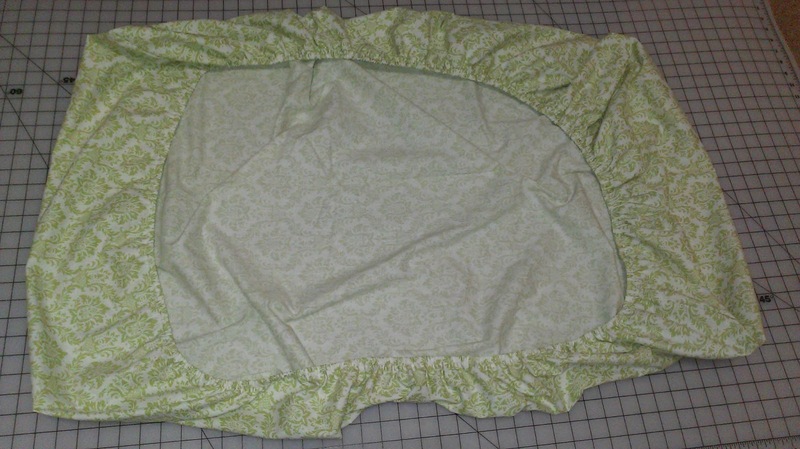 I found a great tutorial at Dana Made It for fitted crib sheets. She does an excellent job of outlining the process step-by-step. I decided to outline it for you here, too, because there were a few minor details I thought should be added to the tutorial to make it clear for beginning sewers. Sewers with a little experience would be just fine following the tutorial as-is, but true beginners might have a few questions, which I attempt to help with here. This really is a very easy project that sewers at any level could make! Cut the fabric into a rectangle measuring 45" by 67". 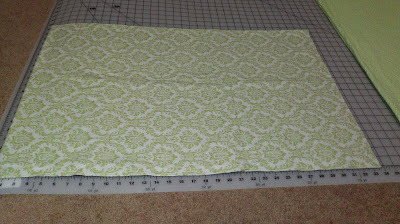 Since I started with 45" wide fabric, I only had to cut the length of mine. I folded it in quarters to make it easier to deal with. Next, cut an 8" by 8" square out of each corner. Since my fabric was folded in quarters, I carefully lined up my edges and cut all four corners at once. 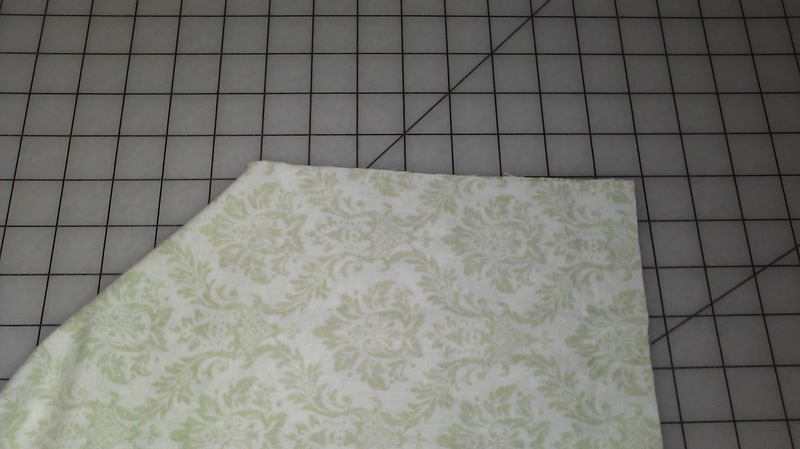 If you choose to cut all four corners out at once, be careful that you are cutting out from the sides with raw edges, and NOT the sides with folds. Otherwise, you'll end up with a gouge out of the center instead of the corners. I know that sounds obvious, but mistakes happen, so be careful. 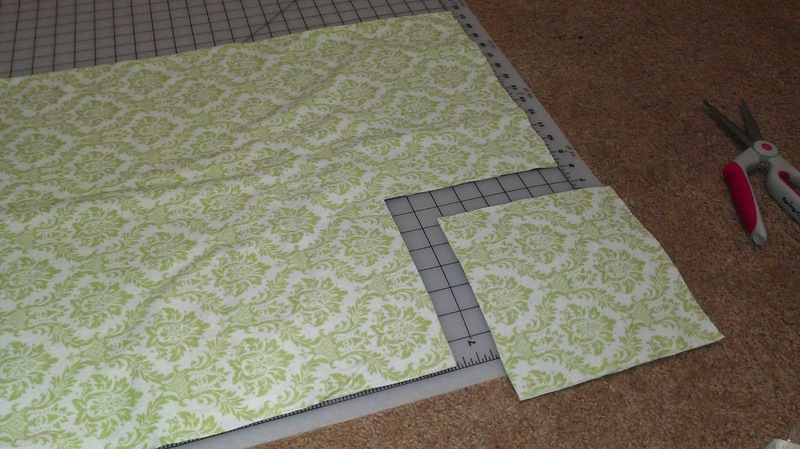 Next, you are going to take one corner and bring the edges of your cut-out square together. 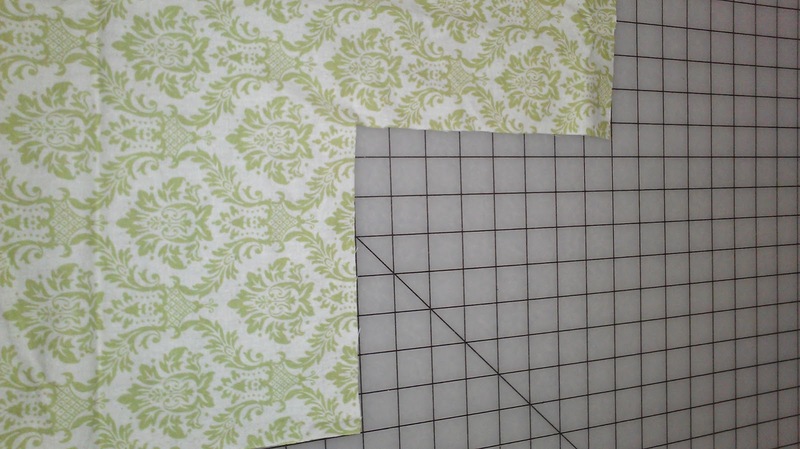 You are essentially folding the fabric on the diagonal to bring the two 8" "sides" together. This is what will make the sheet fitted. 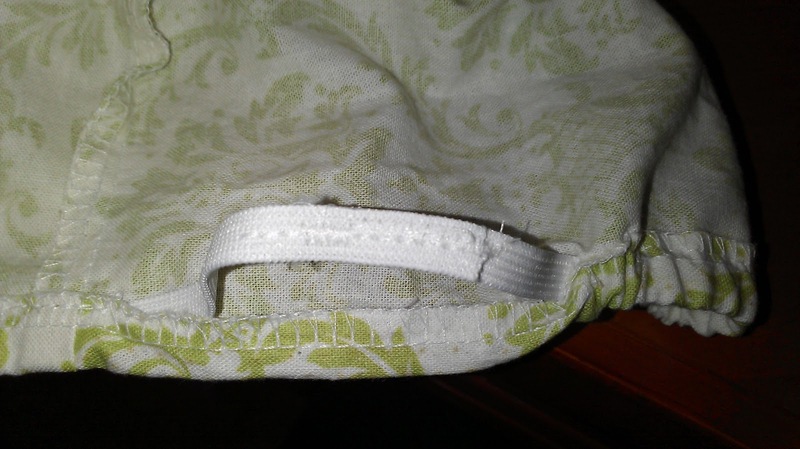 The 8" seam is on the top in this picture, and what was the top edge of the fabric is now lined up with the right edge. See that diagonal fold I was talking about? 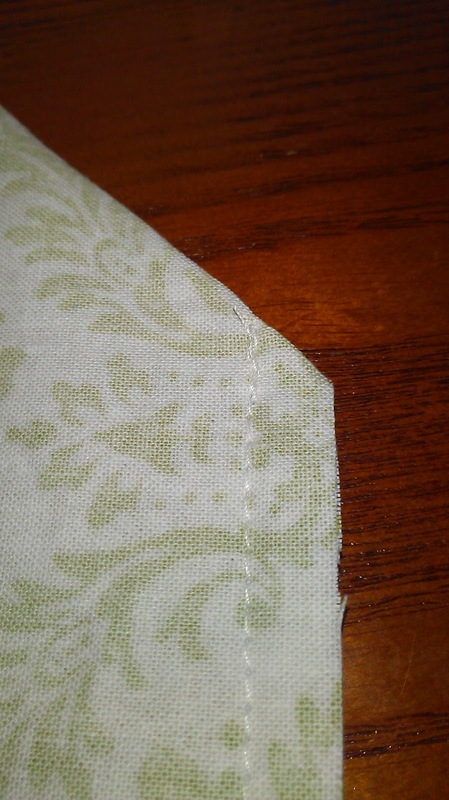 Sew the 8" seam from the fold to the raw edges. Use 1/4" seam allowance (which is usually at about the edge of your presser foot). Finish the seams you just made by serging or zigzagging the edges, and then serge or zigzag around the entire edge of the sheet. 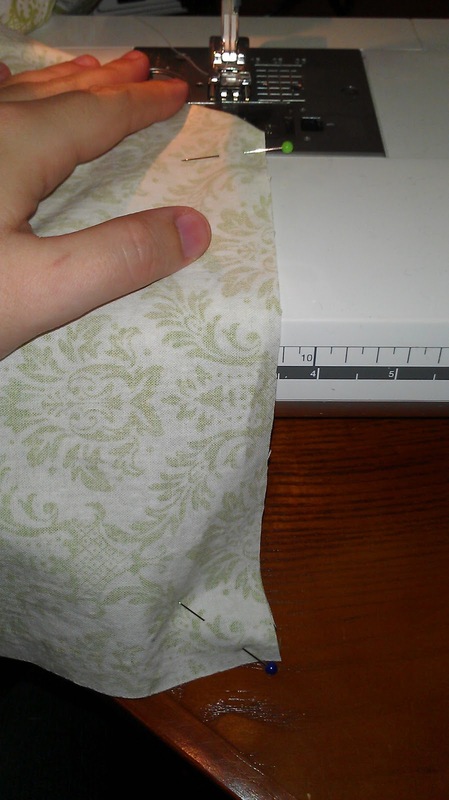 If you choose to use a serger, check out this post for an easy technique to get rid of those ugly serger tails. 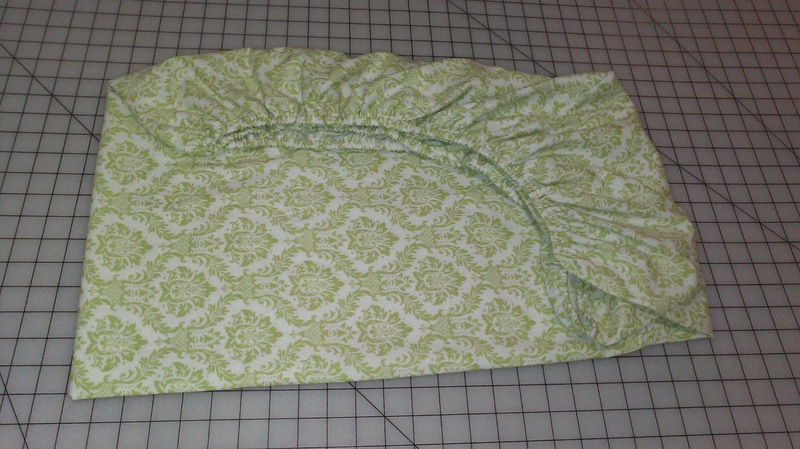 Once you've finished the edge, you're going to fold it over and make a casing for the elastic. The casing just has to be big enough to easily fit 1/4" elastic. 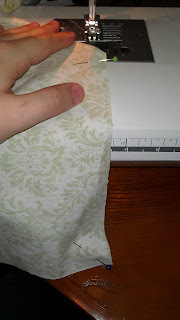 I folded my edge over roughly 1/2" and sewed close to the serged edge, leaving me a casing about 3/8" wide. 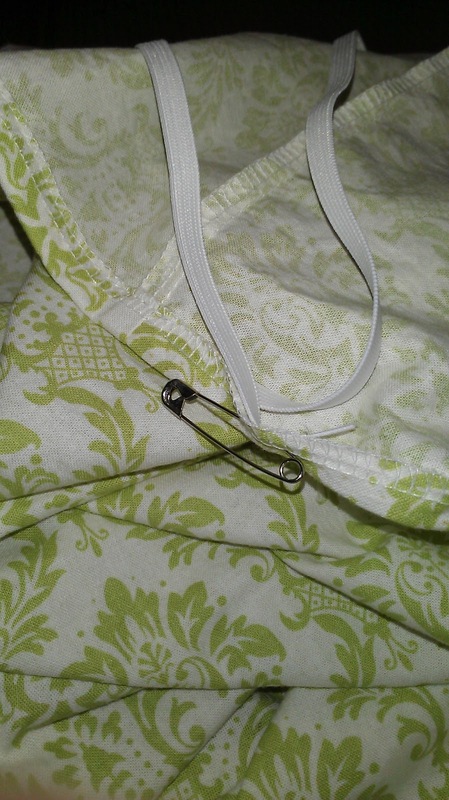 Sew all the way around the edge, leaving a couple of inches open to slide the elastic into. 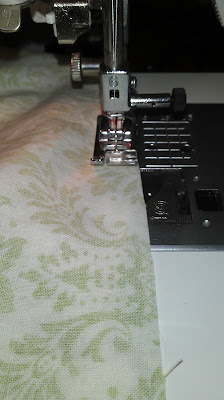 I find it helpful to put a pin a couple of inches behind the presser foot when I start sewing, so I will remember where to stop. You would think you would just know, but trust me, when you start going to town on this long of a seam, suddenly you're back where you started and have to rip out a couple inches of stitches. I despise ripping out stitches, so it's worth it to take the extra two seconds and put a pin in. ...and slide it into the casing. 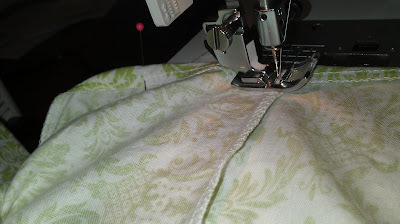 This is the most boring part of making sheets--feeding all that elastic through. It feels like it takes forever, and it's really mindless, so turn on a good sitcom while you continue working the elastic all the way around the sheet. 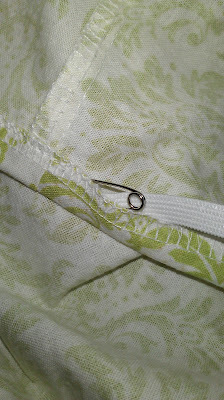 Tip: When feeding elastic, I like to take the loose end and secure it to my fabric with an additional safety pin. I have had it happen one too many times that I finally get all the elastic fed through my casing, when the free end suddenly pulls through and gets lost in the casing. When that happens, you have to pull the whole thing out and start over, which stinks. So secure that free end to save yourself the potential headache. When you have (finally) fed all the elastic through the casing, overlap the ends and stitch them together. I used a straight stitch to hold them in place, and then went over it with a decently tight zigzag. You're almost there! 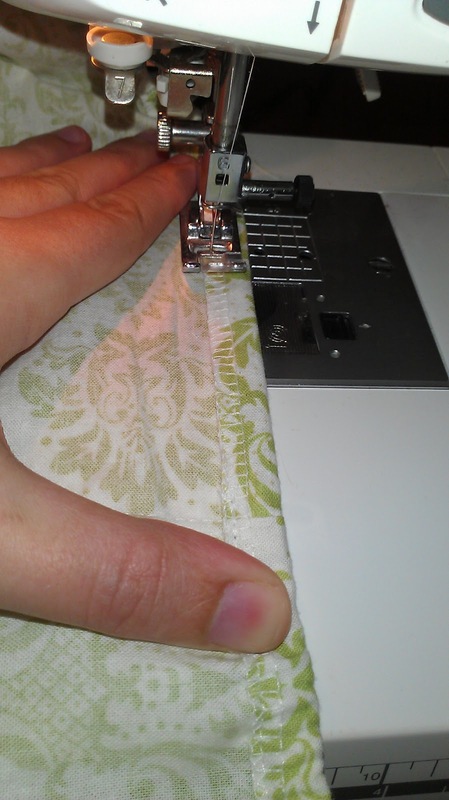 When your elastic is sewn together nice and strong, give the elastic on either side of it a little tug to line everything up where it needs to go. 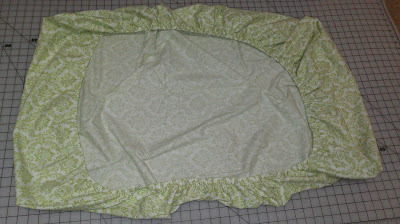 Fold the little open part of the casing over the elastic ends and just stitch it shut, overlapping a few of your original casing stitches. 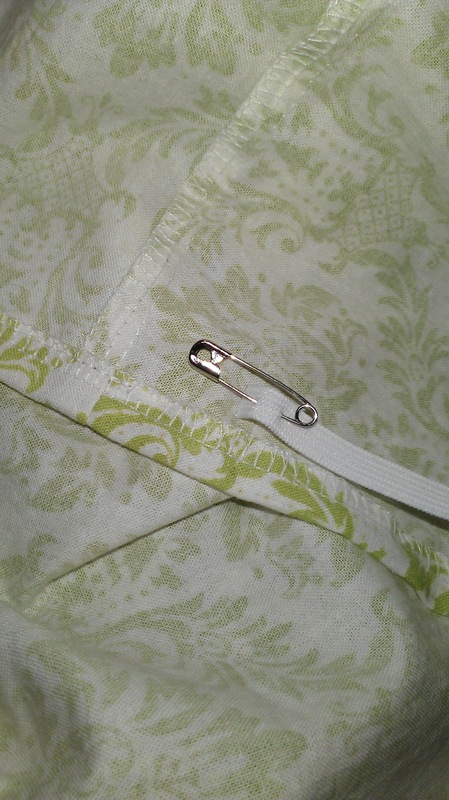 Now your elastic is completely sewn into your casing and you, my friend, are done with your crib sheet! 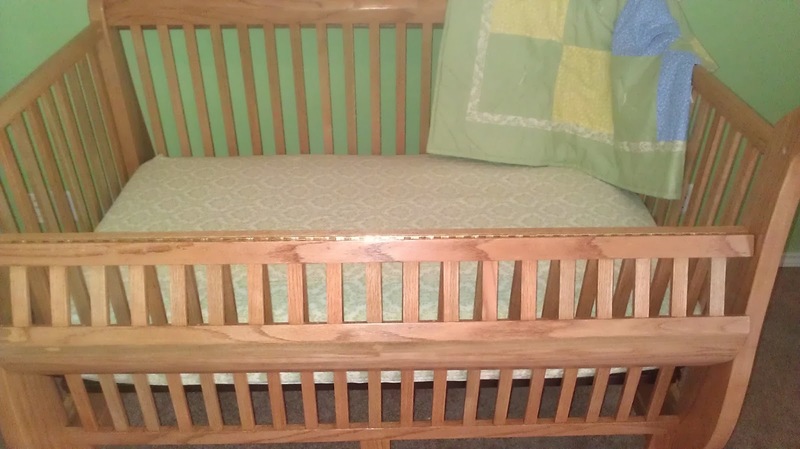 Pat yourself on the back for being thrifty AND making your nursery cuter! I can't wait til hubby is done making our crib so I can see how these look on the mattress! I made Lucas' crib sheets too. So much cuter than what's ready made :) Yours look really nice. Thank you! I agree, they are much cuter, as well as being cheaper!